This David Hunt Joshua, bronze 3 light dual mount chandelier with taupe silk shades is contemporary and features a hand crafted wood look frame. Hand crafted in Britain from cast resin and finished to order using hand and airbrush techniques by skilled craftspeople. 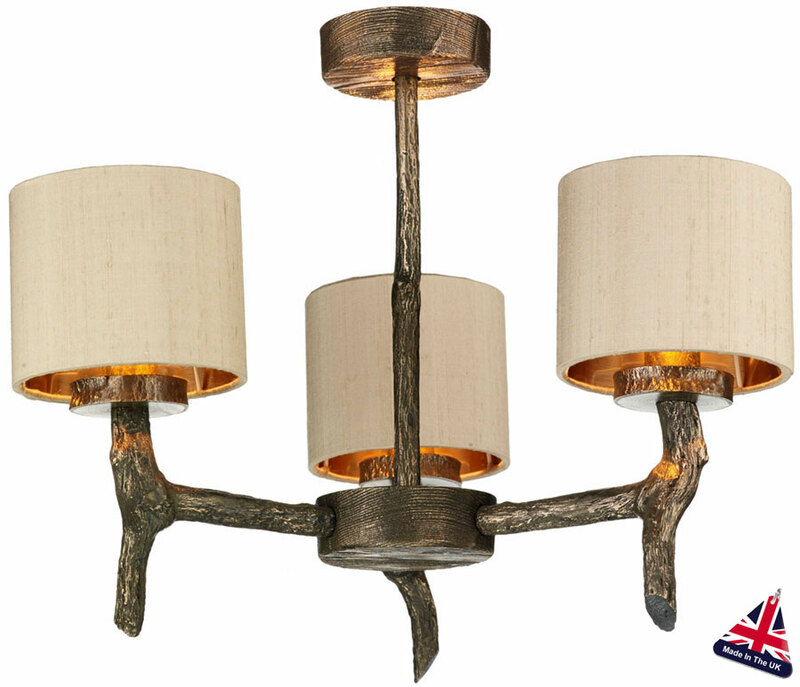 A contemporary dual mount ceiling light made from cast resin, with three bronze effect tree branch arms topped with bronze lined taupe silk drum lamp shades. A matching circular ceiling mount, central drop rod and optional ornate chain suspension completes the elegant design. Capture the contemporary country look with this unique piece of the outdoors. This handmade chandelier features a rough bark look that will be highlighted by the soft light given by the bronze lined silk shade. Searching for a lighting range to complement a themed room can sometimes prove difficult, especially if you are looking for something that will fit into a more traditional or rustic environment. Well here it is! Rustic charm with a contemporary look that is at home in almost any environment. Height adjustable at the time of installation by simply removing chain links or can be used with out the suspension chain as a semi-flush light fitting as shown in the main image. There are coordinating fittings available in the Joshua lighting range that can be viewed below. Hand finished in Britain to order, please allow 7 – 10 working days for your delivery. This light is designed and made in Britain by David Hunt Lighting who are well known for the design and manufacture of original hand crafted products such as the Joshua, bronze 3 light dual mount chandelier you see here.